Welcome back to the blog ! 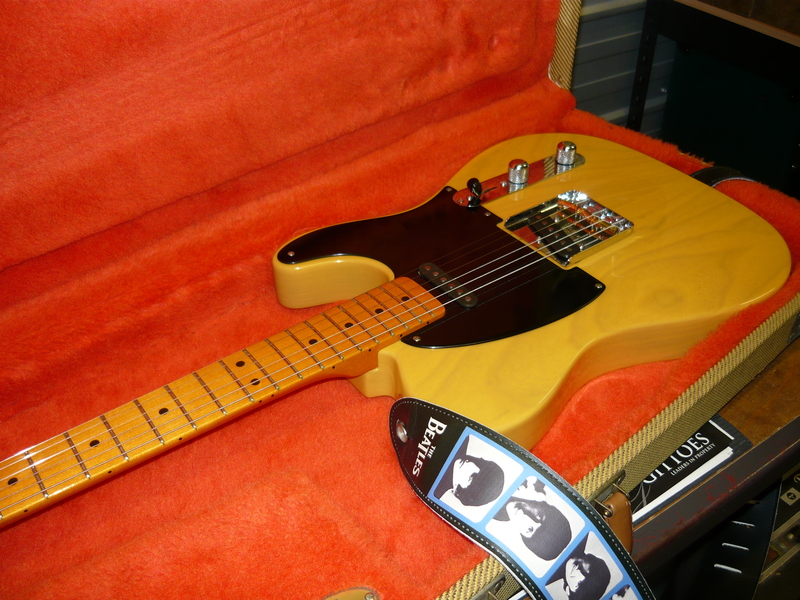 Recently I discussed my intention of upgrading one of my favourite guitars – my ’52 Telecaster Reissue (late 1990’s USA manufacture), with our good customer Chris. 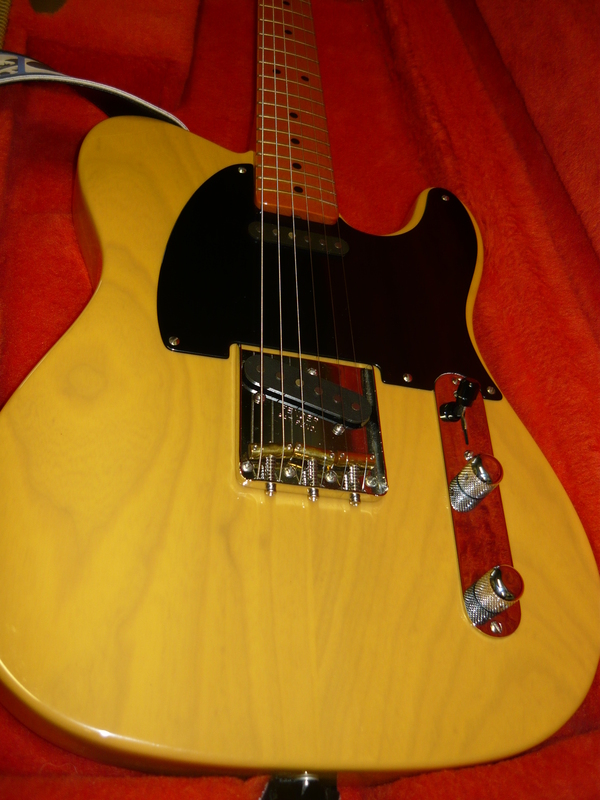 In appreciation of some labour intensive work that we have done this past year, Chris presented me with a pair of Tele pickups from Vintage Vibe Guitars, by Mr Pete Biltoft, wound to my preferred specifications. Chris had previously had some custom work done by Pete Biltoft, with geat success. All the photos that accompany this blog were taken after completion of the upgrade work. According to the Vintage Vibe Guitars website, Pete Biltoft has a strong background in chemistry, metallurgy & precision fabrication. Add to the fact that he is guitar enthusiast, and those are pretty good qualifications for a custom pickup winder. Pete’s designs aren’t a copy of any one specific vintage pickup, but rather they are considerably enhanced & evolved designs for today’s player, while retaining the very best characteristics of the original pickup. If anything, they are somewhat over-engineered for the job at hand. It’s not often that we endorse products to this degree in these blog pages ! 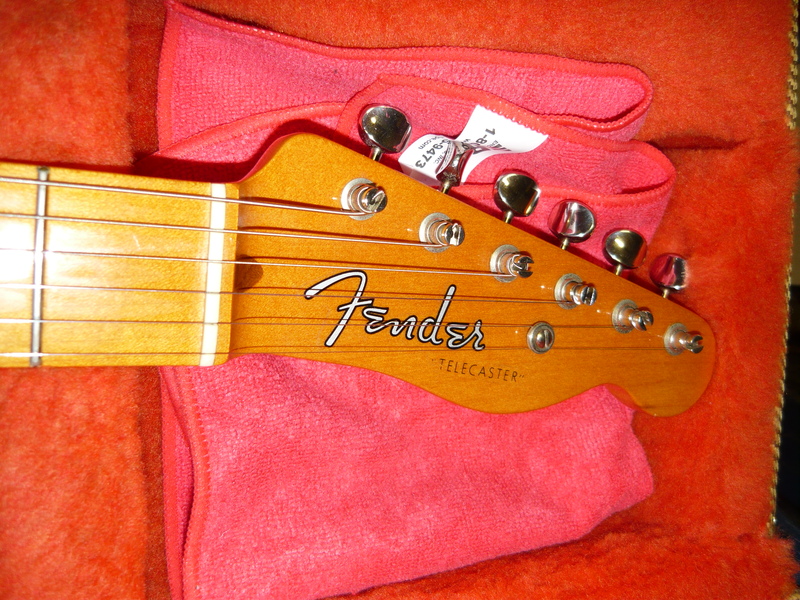 The original Fender Vintage pickups had previously been replaced by a pair of Seymour Duncans. The original neck pickup as usual was totally underwhelming, and the original bridge pickup had loads of character but a very spikey top end which rendered it unsuitable for some styles. 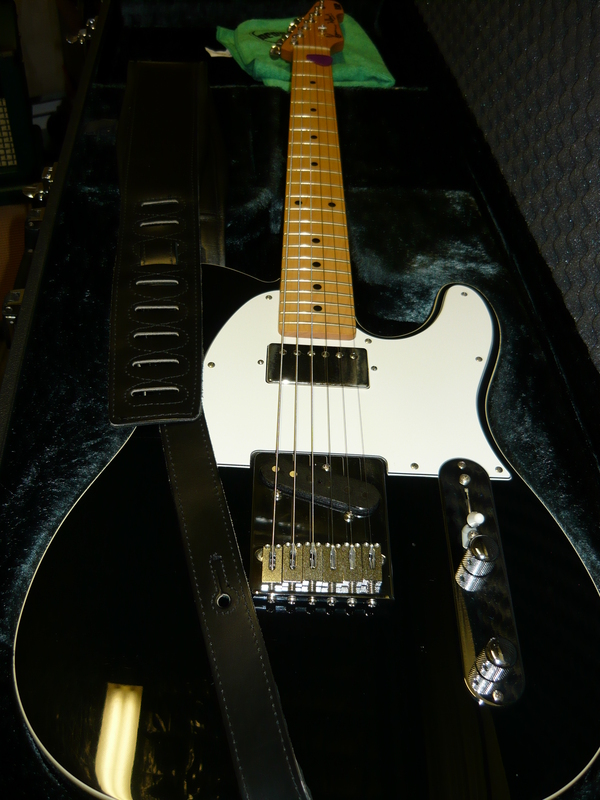 I chose the Seymour Duncan Jerry Donahue bridge pickup and Alnico II neck pickup. The neck pickup would have suited a solo jazz guitarist but not a rock’n’roll band context, and the JD pickup curiously was not a stunning success in this guitar, although in theory it should have been. The bridge assembly is standard, but the saddles are from Acme, by Callaham, for improved intonation. The choice of saddles does have a significant impact on tone & sustain – even brass saddles from different suppliers can sound different, so every variable has some impact, however subtle that might be. 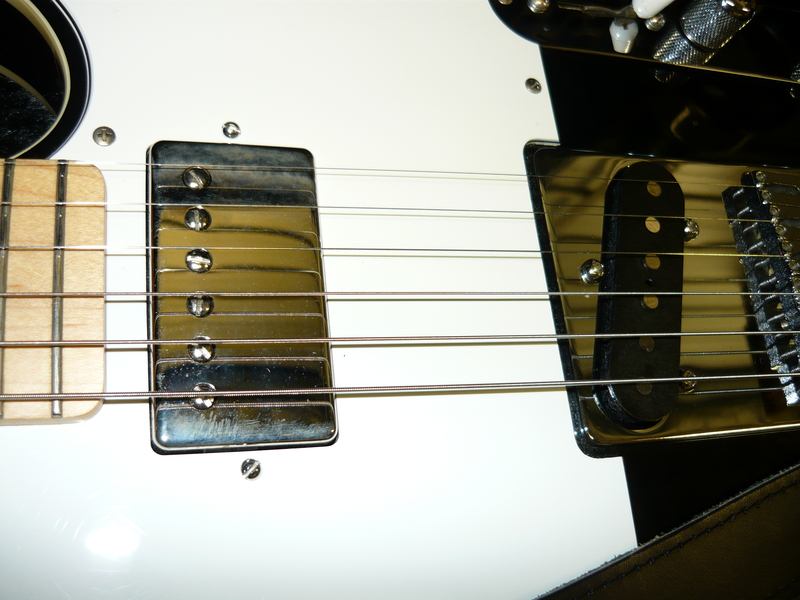 My preferred specification for the Pete Biltoft pickups was as follows: both neck & bridge pickups 5% overwound, both neck & bridge pickups Alnico V magnets for E, A & D poles, Alnico II magnets for G, B & E poles; G pole piece slightly raised & D polepiece raised higher to compensate for the thinner core wire in the D string of most string gauges. As an absolute minimum requirement there should be a very good balance between the neck & bridge pickups, unlike the originals. Normally I would prefer the neck pickup to have the usual cover to maintain a vintage appearance, but in this case I accepted Pete’s recommendation of no cover for maximum tone & clarity. 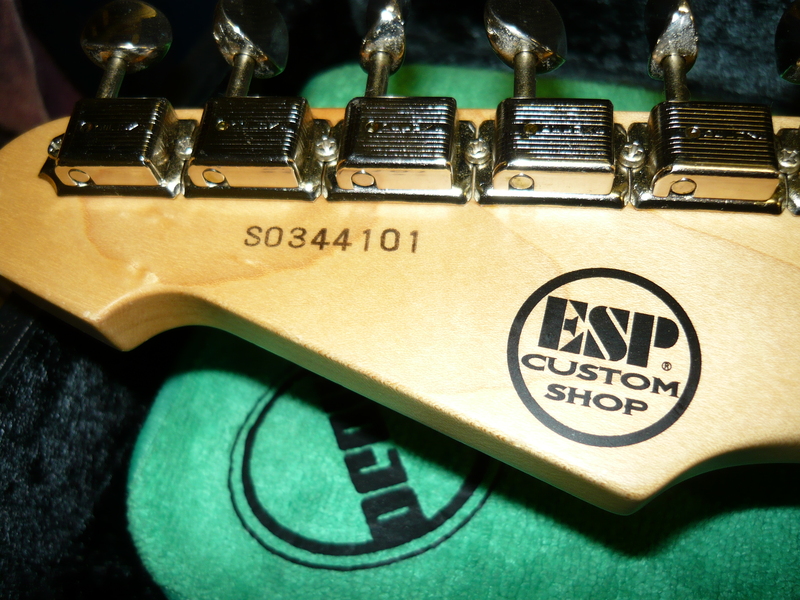 The neck pickup measured 7.4K nominal & the bridge pickup measured 8.3K nominal. The pots are CTS 250K with a 0.047uf tone pot capacitor, with no treble bleed cap, and a standard 3-way switch. Pete has also supplied a 5-way SuperSwitch, to allow two additional pickup combinations – neck & bridge in series, in-phase & out-of-phase. We have yet to install this option. The documentation accompanying these pickups is the best we have seen, and Pete has done commendably well in achieving a balance between the neck & bridge positions, and also a balance between the Alnico V & Alnico II magnets. The Duncan Alnico II neck will go on Ebay. 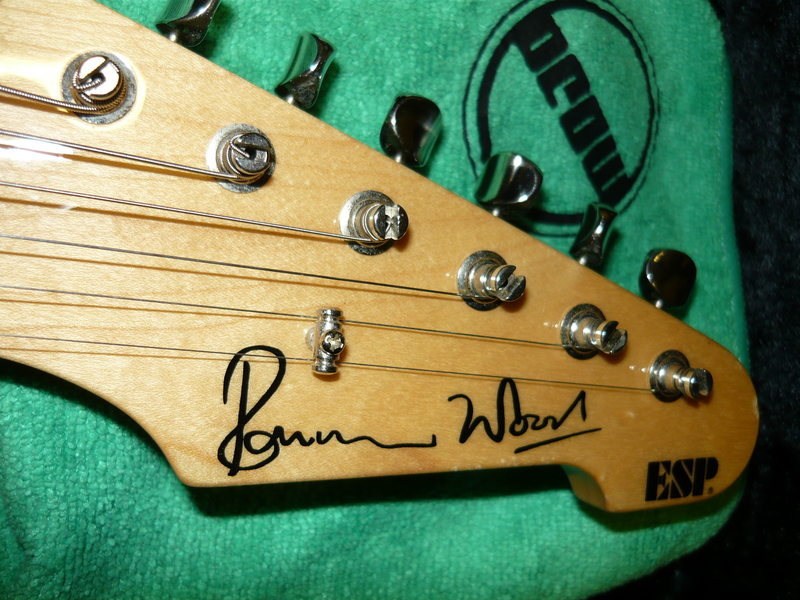 But ref the Duncan Jerry Donahue bridge pickup, I had a hunch this one might work a lot better on my ESP Ronnie Wood Signature Model Telecaster – a very handsome fellow with black body, white binding & maple fretboard, a favourite look of mine. This guitar has had numerous pickup changes, mainly because of the problem of matching the neck & bridge pickups. Considering that this wasn’t a cheap guitar at all (over $2000 AUD retail, $1600 AUD street at the time of purchase), the original pickups were really average. 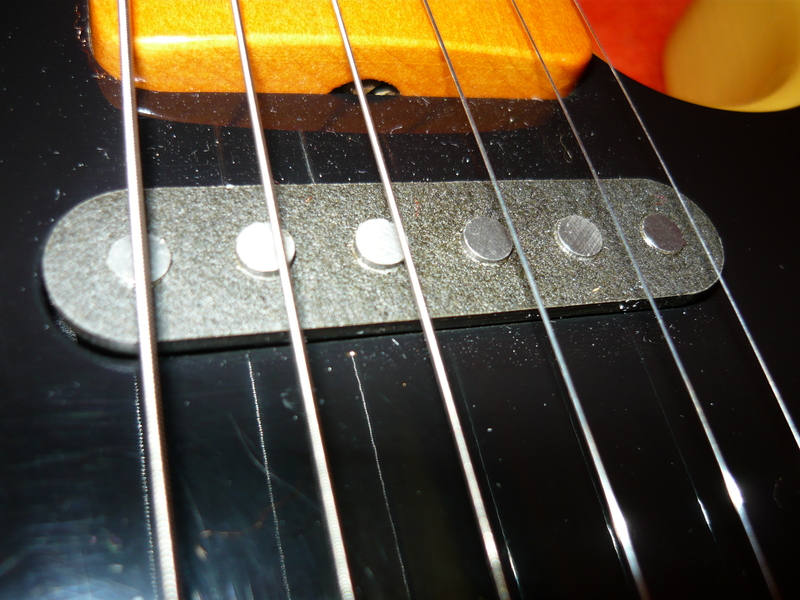 The neck has had Fralin & Duncan humbuckers previously, and is now home to the Duncan Seth Lover Alnico II humbucker, which has a nice warm vintage (50’s) sound and is not too hot compared to a Telecaster bridge. The bridge has previously had Jason Lollar & Jerry Amalfitano pickups, and once again getting the balance just right has always been my problem. Well, my hunch paid off – I installed the Duncan JD pickup in the bridge and together with the Seth Lover it transformed this guitar with nice vintage flavour tones, but actually although it measures 7.5K nominal, the JD pickup sounds vintage but is quite a bit hotter than vintage. Having both pickups with Alnico II magnets makes good sense, the tones & volumes match up better – the pots are CTS 500K with a 0.022uf tone pot cap, plus a 0.001uf treble bleed cap across the volume pot – this is particularly useful with the humbucker neck position. This entry was posted on November 24, 2013 at 12:51 pm and is filed under Discussion, Friends of Ivan Richards Audio. You can follow any responses to this entry through the RSS 2.0 feed. You can leave a response, or trackback from your own site. Great to hear it all worked!